Yeah, I admit it: I am a sucker for this crack-like approximation of Chinese food sold at Panda Express all over the country. 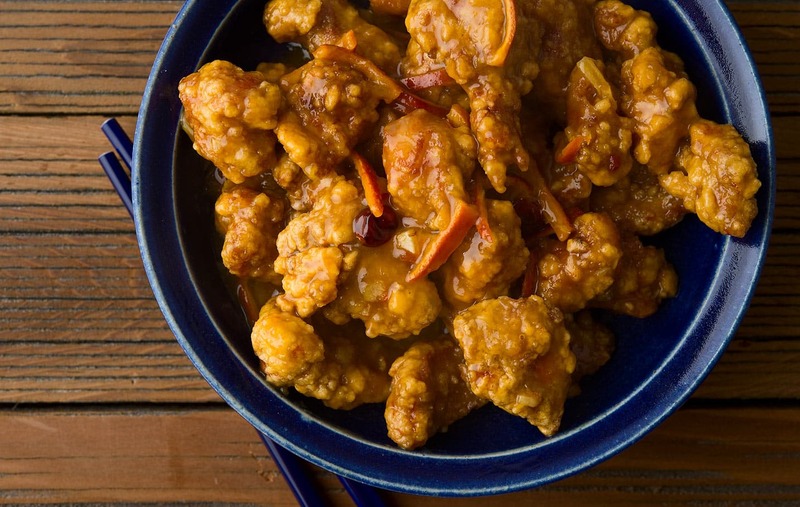 I have no idea whether so-called orange chicken actually exists in China, although there is a vaguely similar dish called tangerine beef I like a lot. 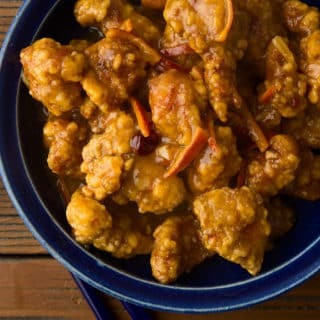 If you somehow have never had it, orange chicken consists of pieces of chicken, usually thigh, marinated and coated in a batter then fried crisp, then tossed in a zippy, citrusy sauce that ranges from pleasantly sweet to cloying depending on who makes it. Some varieties also add chiles to balance things out. If Panda does this, I can’t tell, so when I am there I always order it with some other entree that has those little dried chiles in it. I then bite off a piece of the chile and take a bite from a piece of orange chicken. The sweet-hot-sour is an addictive combination. I didn’t set out to mimic Sad Panda’s recipe when I designed this rendition. I actually had a pretty pheasant breast recipe in mind, but found that when I thawed the breasts, they were kinda torn up. Not pretty enough for what I had in mind. When this happens, Chinese food is one great way to go — everything’s cut into bits! So orange chicken it would be. My recipe is an amalgam of many I read up on, including purported Panda mimics. I also added some actual Chinese elements from what may be the dish’s origin, the tangerine beef I mentioned above. 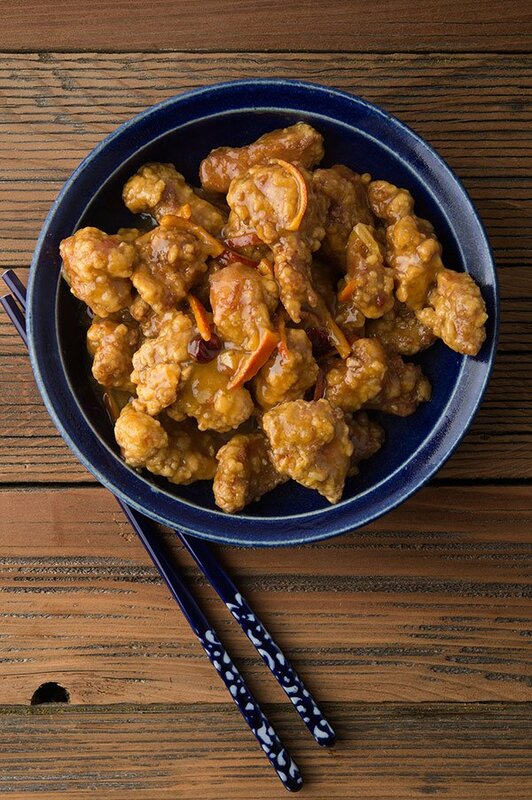 The result is basically an “adult” version of Panda’s orange chicken. The crust isn’t as thick, but it’s crispier. The sauce isn’t as sweet, there’s significant heat from the chiles, and a bigger orange flavor from the juice, marmalade and the peel. What’s more, the slivered peel adds a touch of bitterness that deepens the flavor of it all. If you loathe any sort of bitter, leave out the peel or just don’t eat it — treat it like a bay leaf. Clearly orange chicken can be done with any white meat. 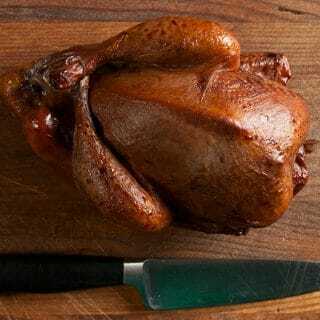 It will work with boneless rabbit, grouse, partridge, quail or turkey, too. The optional ingredients -- white pepper, tangerine peel and green onions -- give the dish a more Chinese feel. I personally like this dish sweet and hot. But some people just like sweet, and that's OK. You should know this is not as sweet as Panda Express. To get there you will need another tablespoon or even two of honey or marmalade. And if you like a thicker crust, add a couple tablespoons of flour to the corn starch you toss the meat in. Mix all the marinade ingredients together with the pheasant pieces; make sure each piece gets coated. Set aside while you prep everything else, about 20 minutes. For the sauce, mix the soy, orange juice, marmalade and vinegar together and set aside. Mix the 1 tablespoon of corn starch with about 2 tablespoons water in a little bowl and set aside. Heat the oil in a wok or small, heavy pot to 350°F to 360°F. Set a baking sheet nearby and line it with paper towels. While the oil is heating, toss the pheasant pieces with the 1/4 cup of corn starch. (This is a messy process, so you'll need to wash your hands at some point.) When the oil is hot, fry the pheasant in 3 to 4 batches until golden brown, about 3 to 5 minutes per batch. As each batch finishes, set it in the baking sheet to drain. After you've fried all the pheasant, pour out the oil into a glass or metal container; you can strain and reuse it later. Rinse the wok and wipe it out with paper towels, then set it back on very high heat. Add about 2 tablespoons of oil from the container you just used. When it's hot, add the chiles and tangerine peel and stir-fry for 30 seconds. Add the pheasant back to the wok and the ingredients for the sauce you mixed together earlier. Stir fry this for a few seconds. Now, start stirring the corn starch slurry, and, while still stirring, pour it over the meat. Stir fry until it gets thick, a couple seconds. Drizzle the sesame oil over everything, give it one more toss and serve immediately. You can find dozens and dozens of pheasant recipes here on Hunter Angler Gardener Cook. Made this with a brace of 4 chuckar by dog helped me bring in during one of our summer dog trials. I saved the legs for chuckar confit. FANTASTIC. even the picky 8 year old was gobbling it up. Awesome with rabbit bits and blood oranges. Another great recipe, thank you so much!